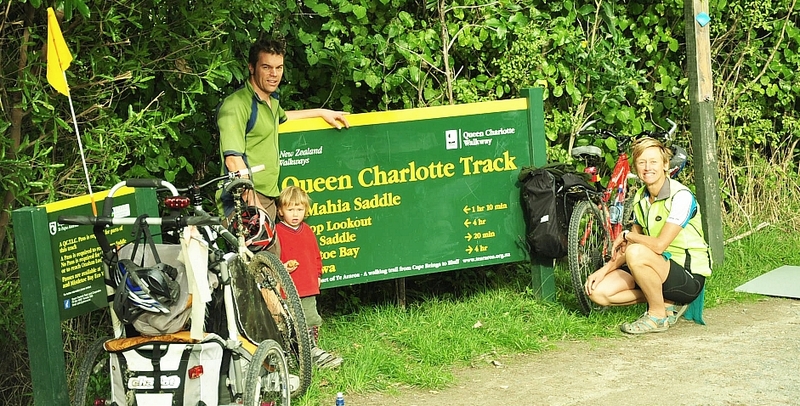 My partner, our child and I recently biked the Queen Charlotte Track. 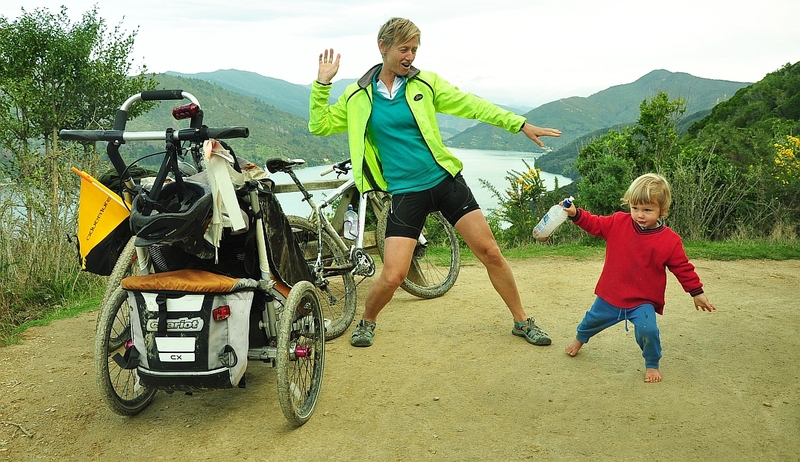 It was a challenging but fun adventure with our two and a half year old son Shannon. It was obvious that Shannon enjoyed the camping experience and being in the bush. 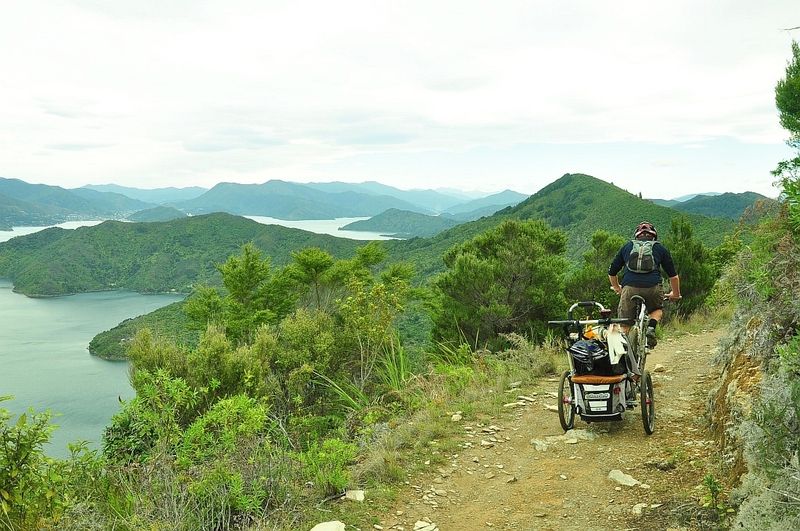 The Queen Charlotte track was good enough for Shannon’s chariot to be attached to our bikes and we only had to push the chariot for around one tenth of the track. The rest of the track is ridable if you are fit, which luckily my partner is and he was even able to pull the chariot up some small sharp steep hills that I had to walk. 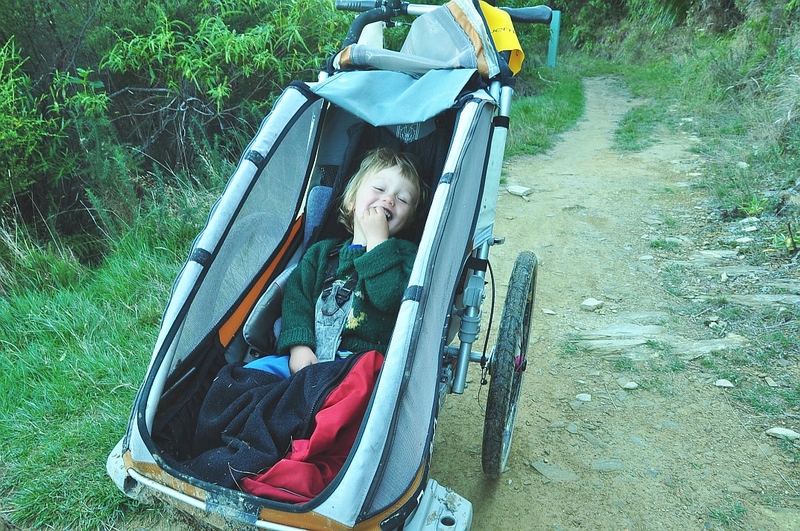 We took it pretty slow along the track to make it more comfy over the more rough terrain. Some sections were gorgeous and smooth, others were rocky and a bit rooty. 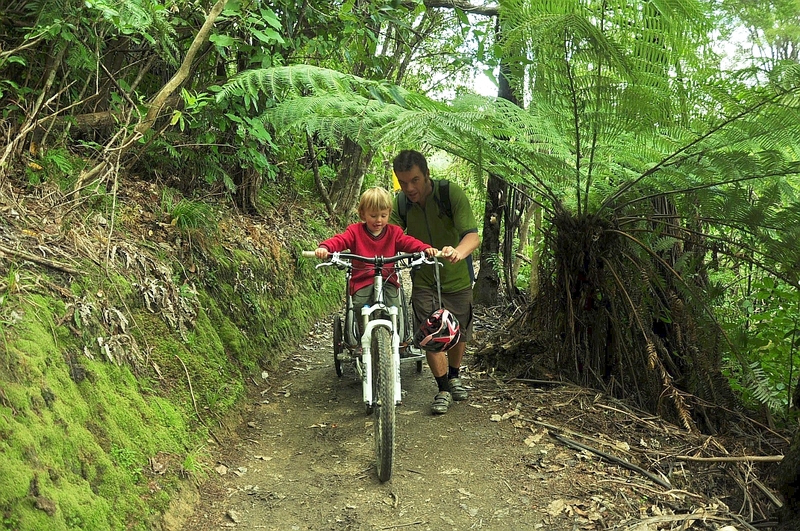 We chose to take the road from Cowshed Bay to Mistletoe turnoff just to avoid a big hill that we would have most likely just pushed up rather than ride. This was a great decision! We got all our gear water taxied to our next camp spot which was so great. We met some lovely people on the way. 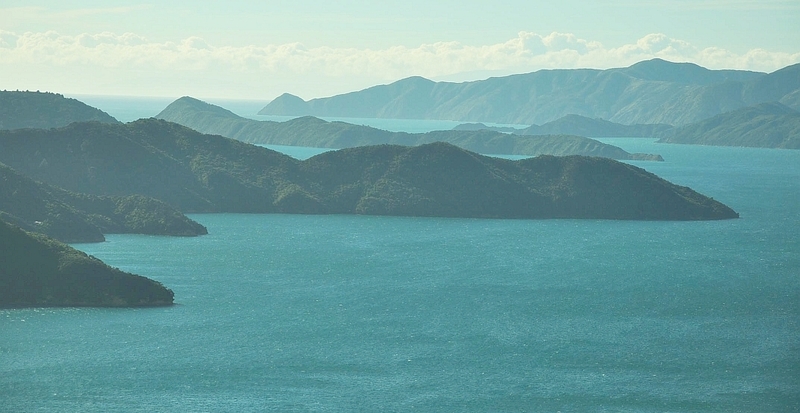 The tops were gorgeous with some stunning views of the sounds. I would recommend this adventure only in really good weather which we were lucky to have. The clay surface of this track would mean that a bit of rain could make it quite yucky! 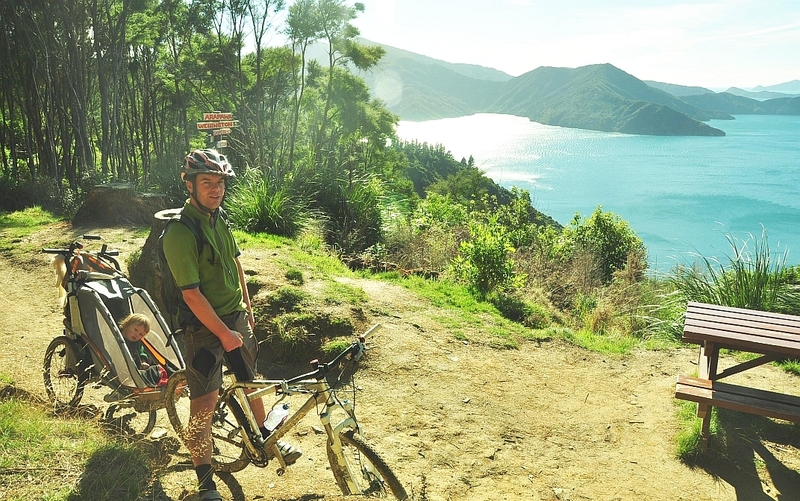 In the heart of the Marlborough Sounds, the Queen Charlotte Track stretches 71 km.The track is suitable for both walkers and mountain bike riders, taking 3-5 days to complete walking, or 2-3 days for mountain bikers. You can find more information on the DOC website. Wow ! That’s amazing pushing the chariot uphill each time. How many days took it to complete the track ? I biked the QCT about 4 weeks ago, also in good weather, but I found it hard to do (I’m a beginner/intermediate mtb-er with a medium to good fitness level). I liked the downhill parts very much; they were quite fast and fun to do, but each uphill part I was walking and pushing the bike. I eventually got off at Mistletoe Bay, starting at Ship Cove the day before. You’re quite right about the weather and the views. Since the surface is clay, do this only when the conditions are drying out, otherwise the track gets slippery. The scenery, though, was very beautiful and there are lots of magnificent views along both sounds ! Recommended, but maybe not by bike (depends on your experience and fitness level).